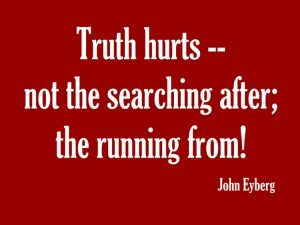 I need lies when I am running from truth. Lies that fulfill me in a wrong way are offered continually to me in every area of my life. When I am in rebellion against the true God, I need lies and deception to maintain my illusions. Freedom apart from God is an illusion of pride. When I am at war with my conscience, lies sustain my denial, my secret war against the still small voice of Truth within. I befriend liars and embrace lies to avoid inner truth. When I’m living in denial, lies excuse my failures and validate my illusions. With this hardened heart I’m not aware of the lies I have embraced. When I am presented with a lie is it the voice of a stranger? Have I befriended the enemy of my soul? Jesus said, “My sheep know my voice and follow me.4Joh 10:14 NIV “I am the good shepherd; I know my sheep and my sheep know me.” 5Joh 10:27 NIV My sheep listen to my voice; I know them, and they follow me. They will not follow a stranger, but will flee from him, for my sheep do not know the voice of strangers”.6Joh 10:1-5 NIV “I tell you the truth, the man who does not enter the sheep pen by the gate, but climbs in by some other way, is a thief and a robber. The man who enters by the gate is the shepherd of his sheep. The watchman opens the gate for him, and the sheep listen to his voice. He calls his own sheep by name and leads them out. When he has brought out all his own, he goes on ahead of them, and his sheep follow him because they know his voice. But they will never follow a stranger; in fact, they will run away from him because they do not recognize a stranger’s voice.” Am I a sheep in the sheepfold of Jesus? He goes on to say, “My sheep don’t hear thieves and robbers”.7Joh 10:8 NIV All who ever came before me were thieves and robbers, but the sheep did not listen to them. Why do I hear them? Have I partnered with them, are they my friends? When the enemy of my soul presents me with a lie that wrongly fulfills me why am I enticed by his offer? The word of God tells me that my evil desires drag me away into sin.8Jas 1:14 AV But every man is tempted, when he is drawn away of his own lust, and enticed. Is that why I hear them? Do the sheep in the sheepfold of Jesus have evil desires? No, I don’t think they can. Can I be a sheep in the sheepfold of Jesus or am I in the sheepfold of the enemy? Is it possible I’m a free range sheep, sometimes looking to God to meet my needs and some times to the world? One foot in Christianity and the other in the world? Is there any protection in that; walking the fence, being double-minded, allowing myself to be blown and tossed by the wind, unstable in all that I do?9Jas 1:5-8 NIV If any of you lacks wisdom, he should ask God, who gives generously to all without finding fault, and it will be given to him. But when he asks, he must believe and not doubt, because he who doubts is like a wave of the sea, blown and tossed by the wind. That man should not think he will receive anything from the Lord; he is a double-minded man, unstable in all he does. Is that who I am? Am I fully committed? The word of God says, “I wish you were either hot or cold but because you are lukewarm I will spew you out of my mouth”. Does my Christianity make God vomit?10Re 3:15-16 AV I know thy works, that thou art neither cold nor hot: I would thou wert cold or hot. Just because I have been invited to be a sheep in the sheepfold of Jesus does it make me one of His sheep? If I pretend to be one of His sheep, and even hang out with His sheep, I’m still not one of them. When he comes to collect them will he winnow me out?11Mt 25:32-33 AV And before him shall be gathered all nations: and he shall separate them one from another, as a shepherd divideth his sheep from the goats: and he shall set the sheep on his right hand, but the goats on the left. How will I know where I stand? Will I not know that I am one of His sheep when every other voice but His is that of a stranger? My Prayer: God, please forgive me for embracing lies and turning from You. It is my nature to listen to strangers. My heart is deceitful and desperately wicked.12Jer 17:9 AV The heart is deceitful above all things, and desperately wicked: who can know it? It is my nature to turn away from you. Jesus, I am wandering around and have avoided the protection of Your sheep fold by only pretending to be one of Your sheep. I humble myself before You God. I am a sinner in need of a savior. Not a savior of convenience but a savior of my soul. God, please bring conviction and bless me with Your gift of repentance. Please draw me to Your Son that I may be a sheep in His fold.13Joh 6:44 AV No man can come to me, except the Father which hath sent me draw him: and I will raise him up at the last day. Jesus, let every voice that is not Your’s be that of a stranger to me. Help me, I am caught up in a web of lies that keep me from Truth.14Joh 8:32 NIV “Then you will know the truth, and the truth will set you free.” I have embraced the lies to establish myself as the authority of my life. I willingly dethrone myself and humble myself before You. You are Lord, please be Lord of me. Be the Lord of my time, my resources, and my soul. All that I have is Yours. Amen.